Designed to be mounted and secured to the top of most vehicles that have an existing or aftermarket cargo rack. 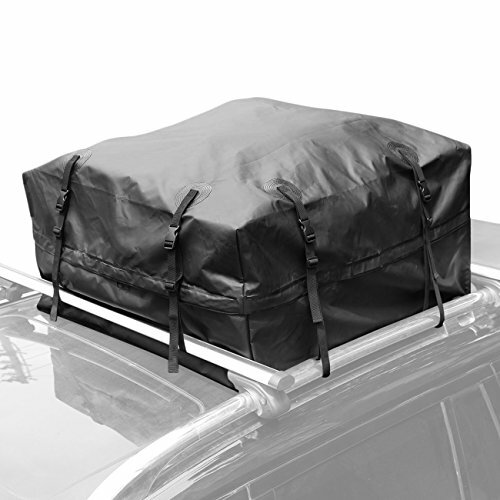 Installed directly onto the roof and secured to the bars of the luggage rack or installed onto a previously installed cargo carrier basket. When properly installed, the zipper opening should face the rear. Roof Top Cargo Bag with 15-cubic-foot storage capacity.Size: 95 x 95 x 46 cm (37.5" X 37.5" X 18"). 8 straps for secure attachment, protects cargo during transport. Hidden zipper avoids rain flap in rainy day. Waterproof design protects cargo against road grit, sun, wind, and precipitation, UV-resistant and waterproof, foldable for compact storage. Installed directly onto the roof and secured to the bars of the luggage rack or installed onto a previously installed cargo carrier basket. When properly installed, the zipper opening should face the rear. Universal durable waterproof roof cargo bag for most vehicles. Soft sides flex to fit odd-shaped loads, offers 15 cu. ft. of big space for cargo.